The following speaker list is for reference only. 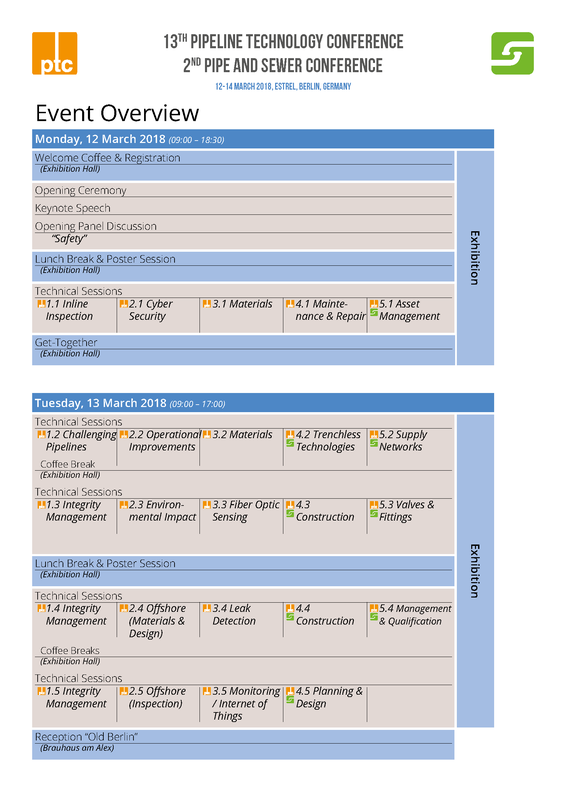 "Restructuring of the Mexican gas supply: CENAGAS’ Pipeline Integrity Management Plan"
"Trial Of A Process For The Identification Of Reduced Depth Of Cover On Buried Pipelines"
"A New Level Of Accuracy For Geometry Inspections With Ultrasound"
"The New 2016 Pipeline Operators Forum (POF) Specification; A Vendors Experience"
"A Case Study On Retrieval Of Stuck Scrapper From An In Service LPG Pipeline - Challenges And Learning"
"Inspection Of Challenging Pipelines - Latest Developments And Case Studies"
"Improvements of an inspection technique for unpiggable pipeline diagnostics from above ground"
"Increased safety against dangerous gas leaks by means of laser and ultrasonic technology"
"Data-Driven Approaches To Pipeline Cleaning"
"Condition Assessment For Optimizing Gasunie’s Network Improvement Program (GNIP)"
"Emergency Response For Colombian Crude Oil Pipeline"
"Crucial Steps For Pipeline Integrity Management System Establishment In South Pars"
"Assessing Repeat ILI Data Using Signal-To-Signal Comparison Techniques"
"Steel Pipeline Failure Probability Evaluation Based On In-Line Inspections Results"
"Ensuring Reliable Operation Through Lifetime Extension Studies For Pipeline Systems"
"RoCorr MFL-A Ultra – Making the Invisible Visible; How pipeline operators benefit from the highest resolution available in inline inspection." "How To Organize The Cyber Security Of Your Pipeline Management System?" 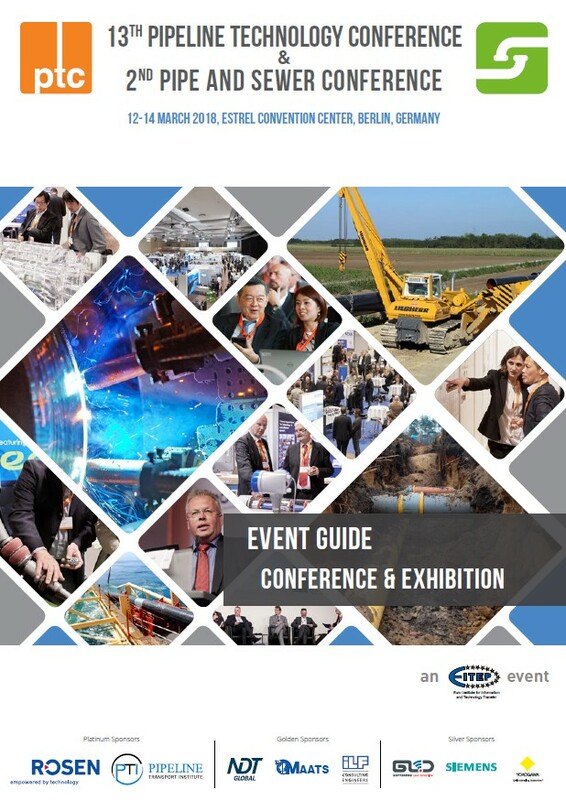 "Smart Pipeline Management: Operating Pipelines Safely And Cybersecure"
"Good practices for the diagnosis of Cybersecurity in Industrial Environments"
"Pipe Manufacturing Challenges For Nord Stream 2 Project"
"System pressure test for offshore pipelines - Are there alternatives?" "On-Bottom Stability Design Challenges For Subsea Pipelines With Extensive Crossings"
"An Innovative Technology Of Non-Contact Magnetic Tomography Method For Subsea Pipeline"
"Inspecting Pipelines With Discovery™, The World’s First Subsea CT Scanner"
"Deep Water ILI Tool Development And 5 Years Operational Experience"
"Nonintrusive Pipeline Internal Deposition Mapping Service Provides Insight To Operators"
"An Investigation Into How To Optimize The Effect Of Drag Reducing Agents On The Flowrate And Pressure In Single Phase Fluid Pipelines"
"Pipeline Vibrations – Measurements Under Difficult Conditions"
"Geotechnical Monitoring Of Pipelines Located In Difficult Climatic Conditions"
"Geohazard Challenges Facing Major Oil And Gas Pipelines In East And North Africa"
"Concept Of Designing Lightning Protection Systems In Hazardous Areas - Advantage Of Special 3D Planning Tools"
"Improved Charpy Toughness in the Inter-critically reheated Coarse Grained HAZ of High Strength Steel Welds"
"Effect of welding defects on mechanical properties and fatigue life of girth welds of X80 steel pipe"
"Influence Of Processing Parameters On Recrystallization Behavior For API-X70 Steel"
"Case Study On Environmental Cracking Resistance Assessment Of Welded Segments Of An Interconnecting Sour Gas Feed Pipeline"
"Complex Research Of Metal Properties Of Long-Lived Pipes Of The Main And Technological Pipelines"
"Corrosion Protection Of Steel Reinforcements For Spoolable Pipe"
"First Full-scale Deployment of Nonmetallic Piping in a Newly Developed Oil Field Increment at Saudi Aramco"
"Fiber Optic Pipeline Monitoring Technology - Perspective Of New Generation"
"Enhancing Pipeline Integrity with Fiber Optic Sensing"
"High Fidelity Dynamic Sensing with Advanced Fiber Optic Technology"
"The New TRFL 2017 And How To Fulfil The Requirements Regarding Leak Detection Systems"
"Pipeline Safety In Germany - Why The Lines Are So Safe With Regard To Leak Detection"
"Development Of Subsurface Monitoring And Leak Detection System"
"Pipeline Monitoring As A Tool Against Fuel Theft And Accidental Leak"
"Real-Time Pipeline Monitoring With The Industrial Internet Of Things"
"Enhanced Operating Efficiencies And Safety Using The World Of IoT"
"Reduction In Risk From Third Party Damage To LPG Pipelines In India"
"Finite Element Analysis, Full-Scale Testing And Case Study Of Composite Reinforcement Of Defected Girth Weld Joints On Vintage Pipelines"
"Emergency Pipeline Repair In Practice- Insight In Today’s EPRS System"
"Advanced Methods For Optimization Of Composite Repair Technologies"
"Innovative Trenchless Solutions For Pipeline Crossings And Landfalls"
"The Definition Of The Application Boundaries Of Directional Drilling Technology In The Construction Of Underwater Passages Of Main Pipeline"
"Trenchless rehabilitation of water mains with a Kevlar reinforced composite lining system"
"IPLOCA - Fostering Innovation in the Pipeline Industry"
"Innovation in Construction – Practical Approach"
"Safer & More Environmentally Friendly Material Handling Solutions Using Vacuum"
"Numerical Simulation Of External Loads On Buried Pipelines"
"Pipeline construction equipment, flexibility required"
"Coordinated construction of supply networks in Berlin"
"Is The Gas N-1 Standard Of The EU Regulation A Good Indicator Of The Security Of Gas Supply Of A Country?" 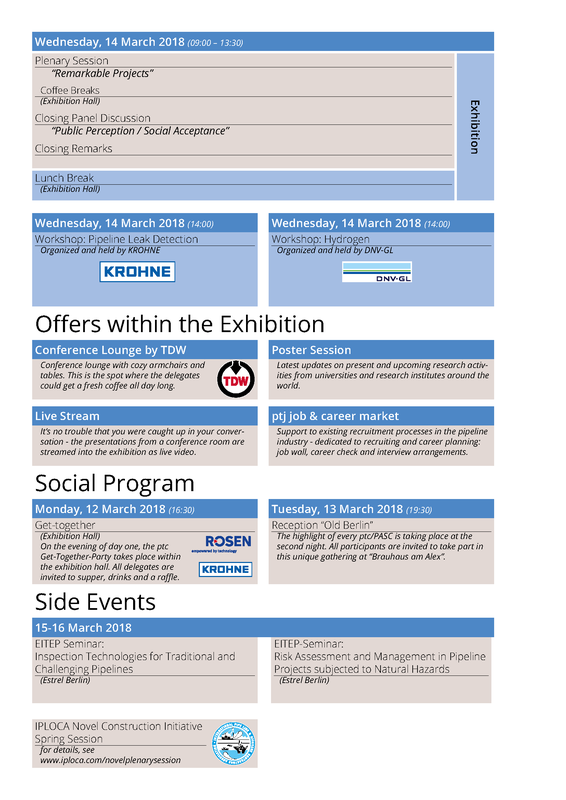 "Hydrogen Infeed To Natural Gas Grid - Overview"
"Key Challenges In The Mechanical And Thermal Design Of Insulated Pipelines"
"Application of stochastic aging models to increase asset value profit for urban infrastructures "
"Optimizing Your Asset Replacement Strategy"
"Is Water the New Oil? Towards Better Integrity Management of Water Networks"
"Interconnectivity And Traceability Applied To Continuous Methane Emissions Monitoring In The Gas Industry"
"The Countermeasure Method And The Monitoring Of Fatigue Failure Of Irrigation Pipelines"
"Verification For Plastic Manholes - Uplift By Water Pressure"
"Risk Based Model For Sectionalizing Valves In Liquid Pipelines"
"Quality control for PE pipe installations: a comparison of QC methods and an exploration of the challenges and advantages of developing new QC approaches"
"Implementation of the DVGW Technical Safety Management at ONTRAS Gastransport"
"Getting The New Generation To Choose For Pipelines – And Keep Them! Establishment Of Young Pipeliners Association (YPA) Europe"
"Where engineers learn to become pipeline engineers – or how to enable Job-based-learning"
"Stress Concentration At Real Complex Pits Of Pressurized Steel Pipes"
"Frictional Pressure Drop Estimation Of Two-Phase Gas-Liquid Flow In Pipelines"
"Application Of Artificial Intelligence Methods On Realtime Laser Backscatter Data"
"Minimizing Required Sensors for Leak Detection in WDN – a Heuristic Approach"
"Sandwich Pipe Joints: Design Considerations For Deepwater Installation"
"Volume Loss, A New Parameter In Assessment Of Remaining Strength Of Pitting Corroded Steel Pipes"
"Two Curves Method For Crack Arrest In Pipes Based On CTOA"
"Optimum Design Of Offshore Gas Pipelines Crossing Active Seismic Faults In The Mediterranean Sea"
"Effect Of Nano Particles Treated With Silane Coupling Agent On Physical And Corrosion Properties Of Heat Shrinkable Field Joint Coating"
"Monitoring Of Pipes By Distributed Acoustic And Fibre Optic Sensors - A Real-Scale Test On A Pipeline Under Normal Operation"
"Intelligent Pigging Data Faults Analysis And Its Effect On The PIMS (Case Study: The 40-Inch Iranian Gas Transmission Pipeline - Igat 1)"
"Simulation The Changes In Pressure, Temperature And The Velocity Of Gas In Various Elevations Case Study On Igat-3 In Distance Of Qazvin-Rasht"
"Trenchless technology renewal of existing wastewater sewer system, methods and materials "
Status as of 6 Mar. 2018. Please subscribe to our newsletter (see below) in order to stay updated.